Well things have been a bit slow around here. The biggest problem with me not posting in the past month is that I’ve been fighting sinus problems. I don’t know if it’s an infection or my head is just clogged with snot. Anyway, I have an appointment with an ENT later this week, so I should get some answers. The weather here has been another contributing factor. I believe we are going on our fourth week of rain, which is not helping my sinus issues. This also put a bit of a “damper” on some of my painting as I can’t get outside and do any airbrushing. 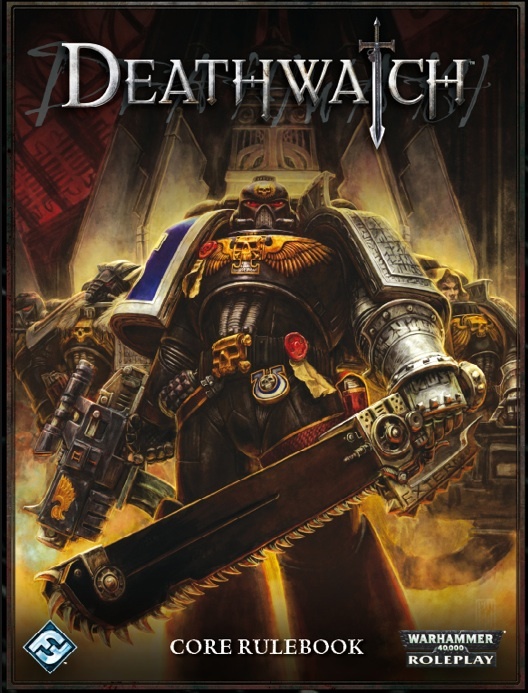 Finally, there’s the fact that I’ve been sucked into a few new games including Deathwatch. Basically, I’ll break down all the things that have been going on into a couple of sub-points. I’ve haven’t been sick for a whole month, just the last two or so weeks. Who would want to do much of anything when they have to constantly blow their nose and still have enough gunk in their head to clog their ears to the point of near deafness? Not me. I’ve also been trying to find a job during this time. I love my hobby, but the funny thing is that it requires money. The sole motivation for me getting a job is so I can buy more toys. Sadly, I think I’ll find a job when both my head clears and the rain decides to stop, which at the current rate of things is never. This has sucked up what time I have when not sleeping of medicine or job hunting. I have quiet enjoyed it too. For starters, Pelicon was held here at the end of June where I had the opportunity to try a couple of games I’ve been eying: Infinity and Full Thrust. I’m going to go ahead a jump into the camp that everyone else that has tried or has played Infinity has jumped into. That is that Infinity is a cool and fun game. It’s not as complicated as I was thinking it was going to be. The demo game I took part in only last maybe an hour, but in that time, I got a good feeling for how the game would work. The guy that was putting on the demo is working on growing an Infinity community here in Pensacola. Given the number of people who tried the demo, that community seems to be on its way to becoming a reality. The people at Bobe’s Hobby House is looking at starting to carry the miniatures, which I’m all for since I like to support local businesses whenever I can. In the same vein of new games, some of you know that I’ve gotten into Fantasy Flight’s Deathwatch. So far my friends and I have just gone through very basic “training” encounters where we are just trying to get a feel and understanding for the rules. I’m happy to say that we all feel comfortable enough to start a proper campaign, so starting this coming weekend, we’ll be starting one of the campaigns provided by Fantasy Flight Games. Naturally, I’ll post a campaign log. Finally, a new game that has truly sucked me in is Full Thrust. If anyone at there still has Battlefleet Gothic ships or plays Battlefleet Gothic, I would suggest giving Full Thrust a try since GW pulled support for Battlefleet Gothic. What can I say about Full Thrust? First it’s a great and solid set of rules that has the largest group of players. The last update the rules received was in the early 2000’s, but the community as add numerous updates since then. A couple of key points that draw me to Full Thrust is that the rules are general enough to allow just about anything as evident by the variety of custom rules or expansions, the rule set for creating ships is logical, fair, and an absolute blast. I’ve spent hours coming up with a variety of ship designs. For Battlefleet Gothic players, I think this could be a great thing to have and try. 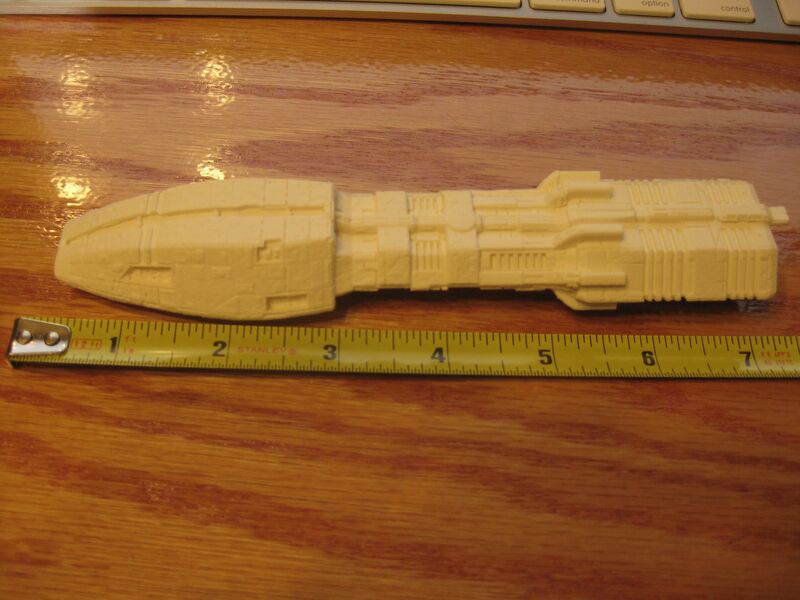 Battlefleet Gothic players can kit their ships out to better represent what they read in the fluff. A Space Marines’ BattleBarge could be the monolithic cathedral of power that it was meant to be. Finally, the most interesting mechanic that I felt was really lacking from Battlefleet Gothic was the use of fighters. Full Thrust provides a very robust fighter mechanic that allows players to use more modern naval tactics. Case in point, my first game I participated in my fighters did more damage, destroying one ship and severely crippling another, than my main ships did. You can check out the battle report on my second battle on The Miniatures Page. To give you a heads up, I was the Colonial Fleet from Battlestar Galactica. I really need to get back to updating more often I know. The nice thing with getting into more games is that I’ll have more topics to post. For starters, I’ll be making a player’s handbook for all the players that will participating in my Deathwatch campaign. It will basically be a condensed version of the main rulebook that way they can look up all the different traits, talents, weapon stats, weapon upgrade, etc. themselves without waiting or fighting over my single copy of the rulebook. Naturally, I’ll post a copy here for people to look over, give criticism, or download and use. There’s the standard painting work that I’ll be doing. If I can get a job, I can drop some money on a airbrush booth, a good photo booth, and equipment to post some tutorials. With Apocalypse out, I’ll really hammer away at completing the Horus Heresy army list as I can see a lot of people using heresy armies in the upcoming Apocalypse games. Along those line, I find a great tool the other day while wondering Dakka. Unit reference cards that you can make for you Warhammer 40k units. 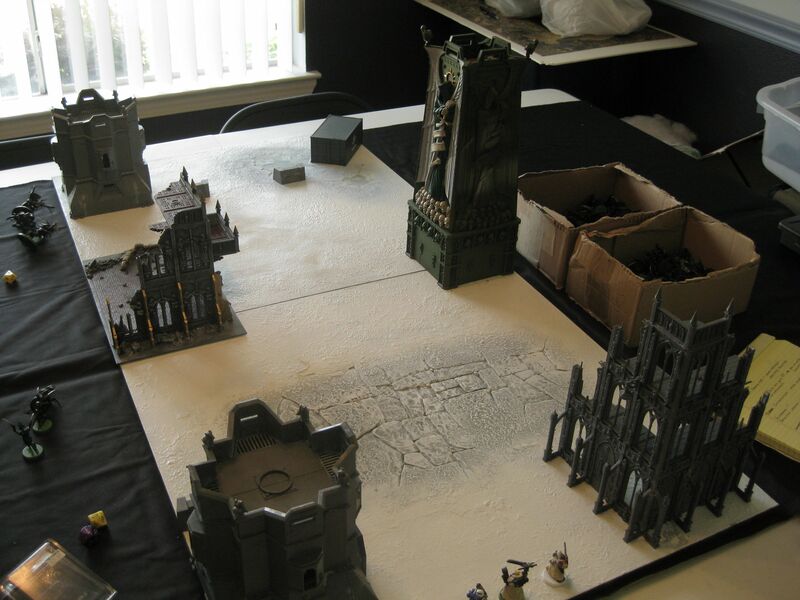 Even as a veteran player, I think this idea is great and plan on using them in with my armies. You can find more information on the cards here. I’ll try to get a couple up in a while to show you what I’m talking about. In the area of Full Thrust, the start of my own Colonial Fleet came today. 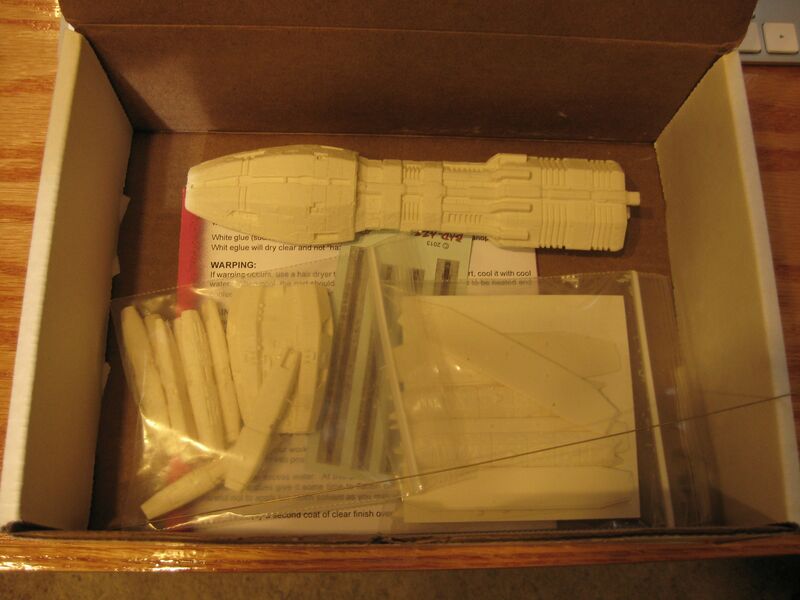 The Battlestar Pegasus is from Bad-Azz Resing Model Kits, and she is beautiful (keep in mind the box was full of packing peanuts when I opened it). As you can see, there is no flash on any of the pieces, and from my look over, there is also no warping. You can also see that she’ll live up to her nickname of “The Beast” as she’ll probably come in at almost 8 inches once constructed. I also received a sample of fighters from Jim Fox of Fox Miniatures. I only have a couple, and they are too small to photograph right now. If you want more information you can email him: fox@foxminiatures.com. Naturally, I’ll posts updates on construction and other aspects of my growing Colonial Fleet. This may still be making its way around the tubes when this get posted, but Bolter and Chainsword suffered some hard drive failures, and suffered further set backs when the new drives failed to mirror. Currently, there is donations being accepted as Brother Argos pays for and is the only technical support Bolter and Chainsword has also suffered personal problems over the recent months that is hampering the speedy recovery of the site. You can read more on Bolter and Chainsword’s Facebook page, or check out Bolter and Chainsword’s site. I have personally found Bolter and Chainsword to be one of the better 40k forums where the people are a bit more laid back. As always, I look forward to hearing from everyone. The kill team entered the map on the edge where you can see the marines standing. They performed a couple of Perception tests to see if they could detect anything in the first to buildings they came too; however, since we forgot that their helmets gave them a bonus to Perception, they failed and had to gain entrance to the building. The door on the bastion was locked, and the door on the administration building was not. 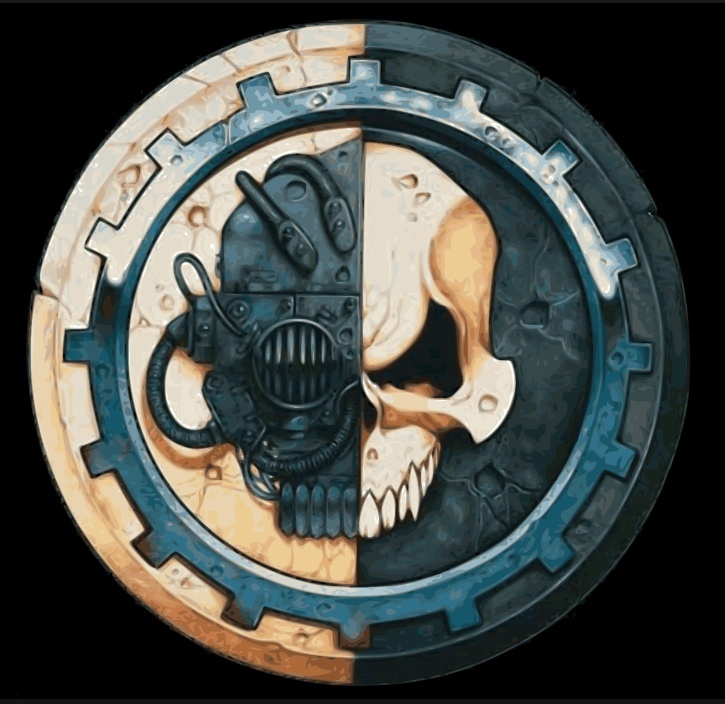 The Techmarine choose to simply punch the door open with his Servo-arm than unlock it. After that, the team split up and slowly cleared the building. Once they reached the top floor, they took another Perception test to see if they could detect anything further down the road. A Shrike and a Magnitute 30 horde of Hormaguants popped up. The Shrike was waiting at the top of the tower and the guants where lurking in the ruined building across the street. We followed the rules for starting combat, but that’s when things got ugly. To begin with no one was surprised, which I was disappointed by because I was trying to figure out how to do ambushes. It seemed to work but with disastrous effects for the team, since we were using a 1 inch to 1 meter scale for movement. I wanted to make it tough, but they way the combat was going it just seemed off. We also bumbled the damage the librarian and bolters could do to hordes, and to be completely fair, there was horrible rolls going on with the players. I ran the same scenerio last night but changed the scale from the previous scale to a 1 centimeter to 1 meter scale. I also factored in the correct damage for attacking a horde; however, this time the pendulum seemed to swing the other way. The squad had plenty of time to react to the horde and kill it before it got to them, and the Shrike only caused 6 wounds on a single character before he died. I think we’ll be doing another field test this weekend, but I’ll have to do some more experimenting and going to the forums to figure out what, if anything, is going wrong. Sepheran grew up on the prosperous hive world of Felmir; however, he very rarely saw the splendor and opulence of the grand theaters, gilded banquet halls, and towering cathedrals that made Felmir famous. For Sepheran and his family, the dark, putrid hovels and allies of the lower hive were their home. It wasn’t by cruel fate or unfortunate that found Sepheran in the squalor of the lower parts of the hive, but rather a choice and mission of mercy taken on by his parents. Sepheran’s parents were talented healers. They could have their pick of a high position at any of the illustrious Apothecariums of the upper hive or even a private appointment to any of the numerous noble houses. However, it was Sepheran’s farther who believed that the Emperor’s mercy and healing was a gift that should be shared. Against the wishes of his family, Sepheran’s farther took his young family down into the lower hive, and effectively severed ties with his affluent family. It was in an environment of hardship, squalor, and death that Sepheran spent his childhood. It was against this backdrop that Sepheran also watched his parents bring a glow of peace and happiness. His parents turned no one away, and Sepheran learned and appreciate the value of human life. Through his mother’s family, Sepheran was able to receive the education any other noble would. However, he learned quickly to hide it from his peers. Even though his family gave medicine and healing to the unfortunate of the lower hive, most of the populace still held contempt for Sepheran and his family and their wealthy background. His parents also brought him up in the mysterious of medicine both out of necessity and pride. By the age of ten, Sepheran was able to provide basic medical attention to friends and people who needed it. This only helped to sooth some of the animosity and tension that Sepheran experienced on a daily basis. However, the violence the lower parts of the hive are known for finally crashed into Sepheran’s little world of existence. Sepheran lost both his parents when they refused to become the personal medics of the violent gang lord Cort. Sepheran escaped enslavement by heading for the surface where servitors and Arbite officers would not allow Cort or any of his gangers to travel. It was during his flight that Sepheran decided to make his way to the Baal and attempt the Journey of the Aspirants. Using his grandparents’ name and his medical training, Sepheran made the long journey to Baal. His natural disposition to the mysteries of the Apothecarium made him a natural candidate for further training and induction into the holy order of the Sanguinary Priests. The Sanguinary Priests were moved by his compassion and solemnity with any task or patient placed in his hands. Corbulo, master Apothecary for the Blood Angels, took Sepheran under his charge as Corbulo felt Sepheran embody many of the angelic qualities of their noble primarch. Sepheran became a stickler for the rites and recitations of the Apothecarium. While most apothecaries take their duty seriously and look on the duty of collecting a fallen brother’s gene-seed with quiet reference, Sepheran took these duties to a more personal level. After fashioning a blood chalices of his own, Sepheran took to inscribing the chalice with the name of any battle brother he tended to in their final moments while at the same time filling it with a few drops of their precious blood. It was the assault on Zoran that Sepheran earned notoriety: for good or bad. Members of the Alpha Legion infiltrated and caused an up rising on the frozen planet. Along with Sepheran, elements of the 3rd and 5th company were dispatched to quell the up rising. During the fighting, Sepheran would render aid to many of the civilians that where unable to evacuate. Many of his battle-brothers, having the mentality that any civilian or human present was a rebel and possibly touched by the ruinous powers of Chaos, saw this behavior as weak and foolish. Sepheran’s commanders had mixed feelings. 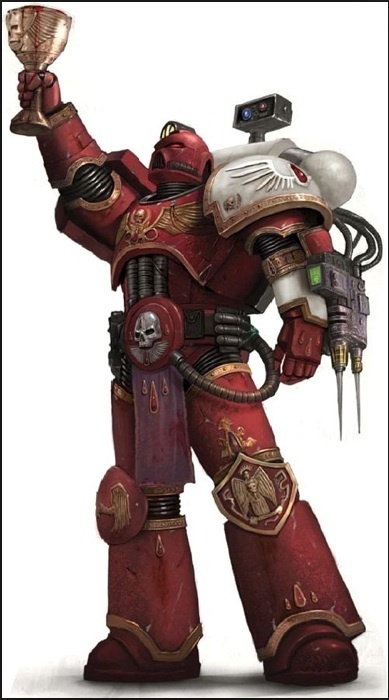 Some believed they reflected the noble and angelic nature of Sanguinius, and that the Blood Angels are the protectors of all of humanity. Others felt Sepheran’s actions where at best misguided and over zealous. Hoping to atone for his deeds, Sepheran sought out the Deathwatch where he continued to render aid to any that needed it. Through many selfless actions and harrowing rescues, Sepheran gained the attention of many of the Watch Commanders. Feeling that some of their Watch Captains focused too heavily on the threat to humanity, the Watch Commanders raised Sepheran to the rank of a Watch Captain hoping that those around him and below him will remember that it is the people who make up humanity that the Deathwatch was created to protect and help. Since then, Watch Captain Sepheran has always made it a priority to first protect and rescue people before plunging into the darkness of battle and the horrors of the void. Brother Hector is not a notable Captain or comes from a noble house in the Ultramar Sector. He is a Marine, a Brother, an Ultramarine. Hector’s birth on the Garden World of Iax was one wrought with tragedy and significance. Hector’s family was simple residents of the city First Landing. 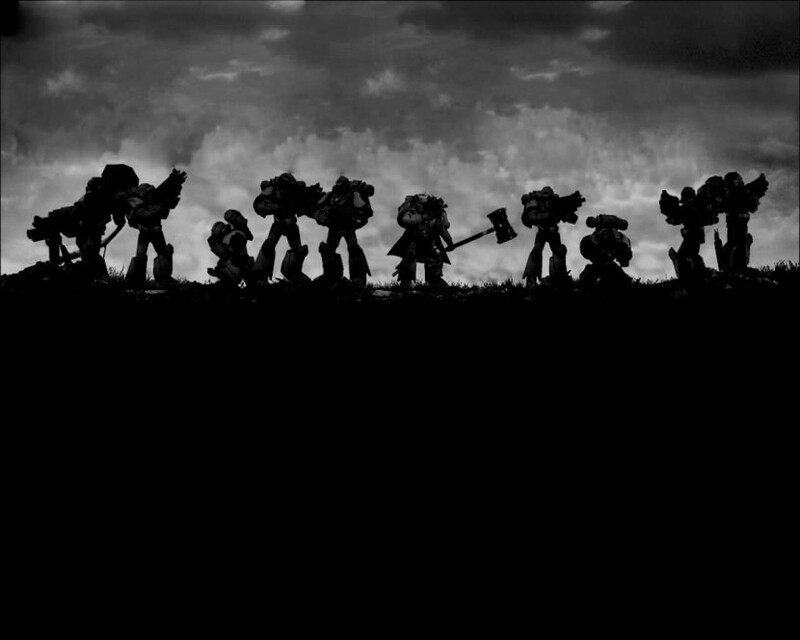 They were a family that honored the Imperium and the Ultramarines, and they were loyal and disciplined in their work. Ultramar is filled with people and worlds that live in balance and thrive with a perfect mix of productivity and recreation. Unfortunately, Hector’s family was tortured by the fact that they would likely never have children, for Hector’s mother was told by the Medicae that her reproductive organs were in major disarray. It was unlikely she would ever have children and, in that slim likelihood that she did get pregnant, the child would likely die long before ever being born. But, whether through sheer will and strength or from the blessing of the Emperor, she was able to conceive and bore Hector. The event did not go without tragedy; however, Hector’s mother died giving him life. As he got older, he vowed not to waste the life his mother sacrificed so much to give. Hector worked on the family farm with his father and ranch hands until he was old enough to compete in the trials to join the ranks of the Ultramarines. Hector saw it as his duty to the world and the Imperium that he loved and to his mother. She fought and persevered over every obstacle for him and he would do the same and not let anything stand in his way of being everything he could be. Hector completed the trials and earned his right to don the mark of the Ultramarines. Throughout his training and, ultimately, inclusion into the 10th Company, he was an exemplary marine. He was well versed in all forms of combat and skills with nothing really standing out about him except for his tenacity. Whenever his sergeants or instructors told him that he either couldn’t do something or he failed to achieve a goal, he would rethink his methods and approach with new tactics. He would do this over and over until he succeeded where so many either failed or gave up. His calm, calculating nature combined with his unwavering resolve did not go unnoticed for long, however. Brother-Sergeant Telion was the first to notice Hector, for Hector reminded him of himself when he was younger. Hector was soon promoted to the 7th Reserve Company before filling vacancies in the 3rd Company. 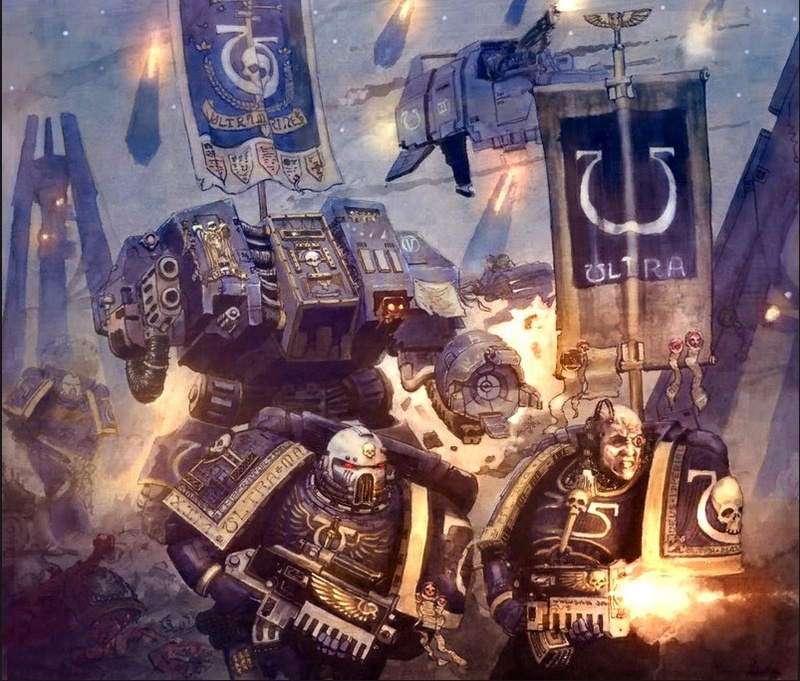 Hector’s initial service with the Ultramarines in the 10th, 7th, and later the 3rd were filled with minor skirmishes and battles, nothing extremely taxing for a mighty Astartes. He quickly distinguished himself as a versatile member of his squad and a competent second in command allowing his unit a greater flexible stance in engagements. However, his true nature and strength did not show until his new home, Macragge, became the target of a great and unspeakable horror, the Tyranid Hive Fleet Behemoth. As part of the 3rd Company, Hector saw days after days of combat with little rest in between. His Company was there when they lost the Jewel of the Imperium, Prandium. This lush and vibrant Garden World was renowned throughout the Imperium and one of the first locations of the Tyrnids invasion. The Ultramarines desperately staved off the invasion only long enough to allow the inhabitants of the planet to escape. The several day siege and ultimate defeat left a bad taste in all the Ultramarines’ mouths, especially Hector. So when it came to Macragge herself, the Ultramarines vowed to make the Tyranids pay for all their trespasses. As the Battle for Macragge broke out, Hector and the 3rd Company were stationed on the mighty orbital defense stations and fleet encircling the planet. For days they fought off wave after wave of Genestealers and Gaunts, but no matter how many the fleet or the marines killed, more kept coming. The fight was eventually drawn down to the planet and elements of the 3rd were sent to aid in the protection of the Sirocco Spaceport and then on to Cold Steel Ridge. Hector’s unrelenting fortitude was only matched by the unrelenting force and numbers of the Tyranids. He became a leader and inspiration among his squad mates and Imperial Guard Auxillia as he refused to allow even the slightest glimpse of failure rear its ugly head in front of the great Tyranid Horde. However, his character would not be the same after the tragedy that would befall both his squad and that of his Chapter in the frozen northern polar fortress. 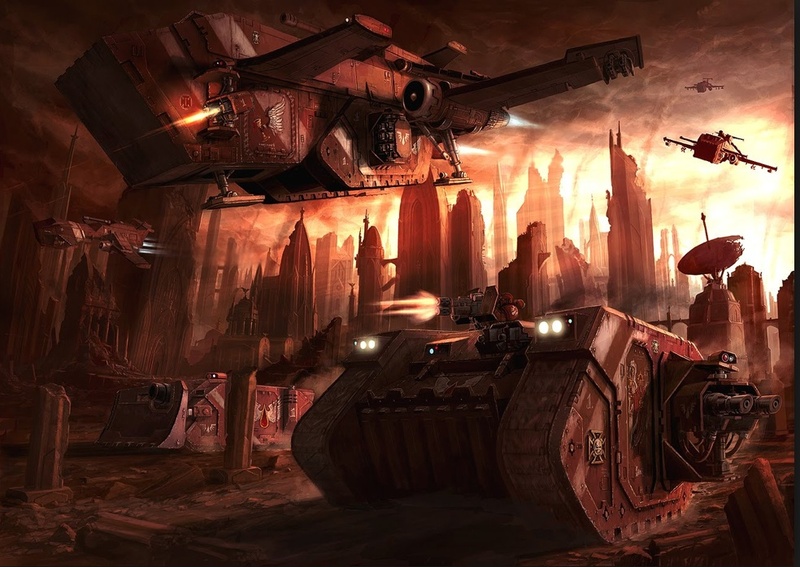 The 3rd and 7th Companies were sent to reinforce the 1st which had been besieged in the northern polar fortress since almost the onset of the Tyranids’ invasion. Tired and battle worn from weeks of fighting they descended upon the fortress. Hector had become a rock for many of his Battle-Brothers from both the 3rd and 7th Company. Their ranks had been depleted but they were still battle strong, and he had almost become a pseudo sergeant for squads that had lost theirs. No sooner did Hector and his squad disembark from their drop pod they came under attack from all manner of Tyranids. In the push into the fortress, they were completely engulfed by both the numerous attacks from the surviving Tyranids and the amount of death that hindered any kind of progress. The two companies suffered major casualties as they fought to take back every inch of the fortress. Hector’s armor bore the scars of each of these encounters and his sergeant and squad showed it, too. Hector would become the acting sergeant when what remained of his squad looked to him for guidance when they lost several of their numbers and their sergeant to a surprise attack from several Lictors and Genestealers. Hector’s ultimate personal test came when he and several squads from the 3rd and 7th Companies finally reached the final stand of the 1st Company. Hector would never be the same after what he saw there that day. Upon entering the room, a flood of emotions filled him and his fellow Brothers. There, in the lower penitorium, a part of Hector died. There, in the center of the room, lay the 1st Company. A circle of Terminators back to back surrounded by mountains of Tyranids, their bodies lying six deep. They had fought until there was no more ammo and then continued until there was no more breath in their lungs. Hector felt great pride in the most courageous and honorable thing he had seen but also felt a great pain at the great cost it took. The fight was over, for some more than others. Since then, Hector has become closed and reserved about those events, allowing very few the privilege of knowing what true honor looks like. After the Battle for Macragge, he joined Chaplain Cassius and his Tyrannic War Veterans in the attempt to bolster the completely depleted 1st Company, for he and what remained of the 3rd Company had seen most of the severe combat during the war. His calculating nature served the War Vets greatly as he and the others quickly devised ways to easily defeat and cripple the Tyranid threat and Hive Mind in combat. 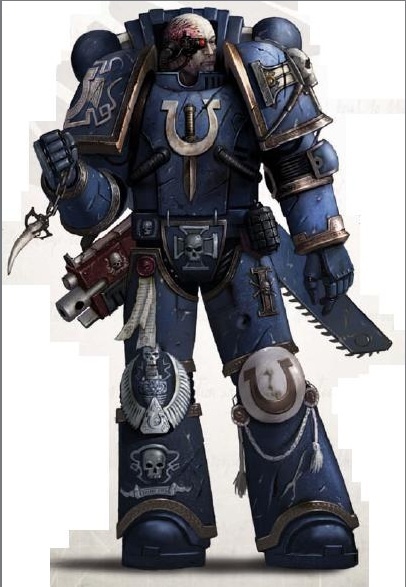 He would go on to fight with the Tyrannic War Veterans in numerous battles, proving to the Ultramarines and the Codex that the Imperium needed warriors like them. Hector was also promoted to the honorable ranks of the Ultramarines Honor Guard where he trained them in the ways of combating the Tyranids before returning to the 1st Company and the Tyrannic War Vets so he could train others. He would become familiar to several Chapters as a cold and calculating soldier and leader, as he was sent out to train others in the knowledge of combating Tyranids that the Ultramarines had learned. He now extends his knowledge to the Deathwatch in order to help the Imperium against the Tyranid onslaught as well as increase his knowledge of the enemies of the Imperium. His armor and his soul still bear the scars of that life-changing battle. The great Techamarines could easily fix his and the other veteran’s armor but it has become a solemn and personal memorial to the events and Brothers they lost. To enemies and those that do not know him, he is Battle-Brother Achilles, a Tyrannic War Vet of the Ultramarines First Company, but to those lucky few that grow a connection to him, he is Brother Hector, a calm and concerned being who loves his fellow man.